If Friday was the day the wheels came off, the third day of this second Ashes Test was the moment when the once-shiny chassis of this England team was dismantled and taken to the wrecker's yard. 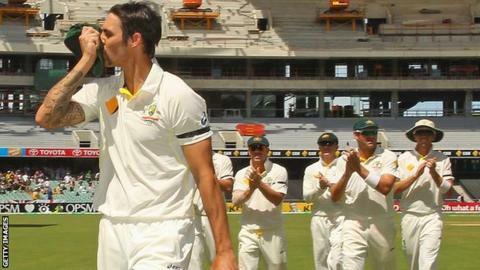 There, at the controls of the car-crusher, mangling everything English in front of him, was Mitchell Johnson - cartoon clown three years ago, dark destroyer in these born-again days of green and gold delight. It is some transformation. On England's last tour here, Johnson was left out on this ground after spraying the ball around the Gabba with incontinent dismay. A year later he watched the next Adelaide Test on television, a surgical boot on his foot, after an operation on his toe that would keep him out for five months. "Mitchell Johnson has taken so much stick from us and from the England fans, but he deserves all the plaudits that come his way. He has bowled as quick as I've seen and been backed up by brilliant fielding. Since winning the toss, Australia have been 50 times better than England at everything." Even last spring he was moping around the wilderness, suspended by Australia for failing to hand in his naughty-schoolboy homework to then-coach Mickey Arthur, going wicketless and being bowled for a golden duck in the sole Test appearance he was granted before this series. And now? Now he has been reborn, part Dennis Lillee, all black flowing hair and bristling moustache, part runaway train, thundering through England's middle order in a cloud of dust and flying stumps. This was one of the singularly great Ashes spells. In three overs after lunch he took five English wickets; in 26 balls he took six for just 16. There was a triple-wicket maiden, two separate hat-trick balls and a relentless cacophony of support around this rebuilt old arena. So incapable were England's recognised batsmen of resistance that number 11 Monty Panesar survived three times as many deliveries as seven of his team-mates. So rampant has Johnson been in this young series that he already has 16 wickets from the three innings so far, his wickets coming at a remarkable average of 8.93 - the best Ashes bowling average from 300-plus deliveries in over 100 years. That he is here at all owes a great deal to the strange cricketing chaos theory that has often inadvertently inspired his best performances. Had Australia's young fast bowling trio of James Pattinson, Mitchell Starc and Pat Cummins not all struggled with injury, it's unlikely he would even have made the squad for the first Test. A self-confessed bag of nerves on his recall at the Gabba, Australia wobbling at 132-6, he then crashed a rapid 64 runs in that critical seventh-wicket partnership with Brad Haddin and immediately felt a little more like he belonged. Having shipped 0-32 off his first six overs in England's reply, the butterfly then flapped its wings again when Jonathan Trott flicked at a wide one down leg side to the final ball before lunch. A small breeze then, a mighty gale here. Johnson's kinetic talent has seldom been in doubt. As a raw 17-year-old kid from Townsville, he was called a "once in a generation bowler" by Lillee; when his full Australia debut eventually came nine years later, he would take 142 wickets in his first 31 Tests. But he carried baggage - the physical, from four stress fractures of the back in his growing years, the mental from those days and months when the mojo flew away and the ball followed suit. "Redemption is a big thing for him," Adam Griffith, his bowling coach at Western Australia, has said. "That and satisfaction he's doing it against a team that's had the better of him the past couple of times he's played against them." Griffith has been a key member in the team of fast bowling experts that have helped rebuild and refine the once washed-up great wide hope. Out in Perth he had him working on several critical technical tweaks: running in straighter, staying tall at the crease, remaining high in his follow-through. From Terry Alderman, scourge of England in the 1989 Ashes, came advice on wrist position. From Lillee, pace consultant for Cricket Australia, came the mix of sage wisdom and raw meat; from Craig McDermott, Australia's bowling coach, comes daily assistance and analysis. "Mitch got to world number one before but got a little bit lost," Troy Cooley, head coach at the National Cricket Centre, told BBC Sport. "For him it's a lot about lower body mechanics, making sure he's nice and strong in the undercarriage. That makes him stand up a bit taller as he delivers the ball and gets his arm in a better position, and that makes him more consistent. "He's running in nice and hard now, and he's relaxed. It's his game sense now, and he's got himself very fit again. He's taking good responsibility for himself, and that's why he's bowling so well. "This is him. When he's fit and strong he bowls beautifully." Then there is the input of head coach Darren Lehmann, as different a man from predecessor Arthur as can be imagined. "Lehmann says to him: 'You're a fast bowler - bowl fast'," Sam Halvorsen, Johnson's long-time agent, told the Sydney Morning Herald. "[Former captain] Ricky Ponting, who I managed for 10 years, stuffed him up in my opinion, because he wanted him to be the spearhead of the attack while bowling first change." Ponting would argue his successor Michael Clarke is lucky enough to be dealing with a vastly improved bowler. Others would point to changes in Johnson's personal life. Remarkably shy off the pitch, less chest-thumper than chin-stroker, his struggles away from cricket have seldom been alleviated with red ball in hand. Two years ago a horribly public feud with his mother ended with her being excluded from his wedding invites. Now, bridges rebuilt, his former karate champion wife Jessica understanding of the pressures of elite sport and his young daughter Rubika the perfect escape from them, he is content in both spheres of his life. From peace comes pace. The slowest of his six wicket-taking deliveries on Saturday was clocked at 89.1mph, the fastest - the one that slapped down James Anderson's middle stump - at 93.5mph. England's middle order in this series has now been detonated three times in three knocks: six wickets for nine runs in the first innings in Brisbane, four for nine in the second and now four for six here in Adelaide. And Johnson is the man with dynamite in his hands. To catch up with the action from day two, check out this gallery on the BBC Sport Facebook page.